Some people with low vision, dyslexia, and related conditions cannot read normally-formatted text in books, newspapers, manuals, web pages, PDF documents, etc. (even with reading glasses) because the text is too small, the colors are too bright or too pale, the letters are hard to distinguish, etc. However many can read text that is formatted differently, for example, with larger text, different font, more spacing, etc. In order to read, some people need to change the way text is formatted; they need to be able to customize the text display aspects. For formal references, see Referring to this material. people with other visual perceptual impairments and conditions that impact reading. The needs of people with declining abilities due to ageing are becoming more and more of a priority for software design. In order to understand the needs of people to customize text for reading, it is important understand the distinction between legibility and readability. Legibility is related to perceiving text by distinguishing letters. Readability is related to reading and comprehending textual information. [readability] Thus text could be somewhat legible to a user, yet not functionally readable. That is, with effort a user could distinguish one letter from another, but could not effectively read sentences because of the text formatting. "My comprehension decreases -- that is, the smaller the print, the less willing my eyes are to READ. So, for example, I can read small print on a map (labels) but not small print in a news story." "Words and letters begin to blur together. Lines of text are easy to confuse with one another. Some letters such as b, p, q and d or i and j become jumbled and seem interchangable with one another. I sometimes begin to read lines vertically instead of horizontally, especially if text is justfied on a screen." "I can only see one or two letters at a time and my eyes jump around and not track across a sentence." Some people cannot read normally-formatted text at all. Some people can read it with varying difficulties. For some (such as Ben), being able to customized text is a convenience; for others (such as Ramón and Angelita), being able to customized text is a requirement. Sometimes people give up. More than half of the survey respondents "quit reading information from the computer (such as an article on the web or instructions in PDF) and not finish it, just because the text is too hard to read comfortably" often every day or a few times a week. Please see When Text is Not Displayed Well for enlightening comments and survey data. There is not a single text format that will meet most users' needs. Research results and published guidelines have different recommendations for specific aspects of text format. For example, leading/line spacing recommendations for people with low vision, dyslexia, or who are older, range from 1.25 to 2.0. [guides] A study of user style sheet settings found that some people (7) set a sans-serif font; some (3) set a serif font, and some didn't set the font at all. Font-family settings were: sans-serif, Verdana, Arial, Helvetica, Trebuchet MS, Times/Times New Roman, and APHont. Without customization, a user's needs can conflict with general best practice. For example, in a study on how people customize text with RTF and PDF files, a participant with dyslexia said, “I write and read a lot better in all upper case”; whereas, all guidelines I've found suggest avoiding all caps, for example, those listed in the references. "low contrast (gray text) as is popular on web sites even on a bright white background creates discomfort, even when only slightly gray, such as #333333. This constant fight shortens my effective day." "I am so annoyed at designers who put pale gray text on a slightly gray background. I find this on the iPad and iPhone and it is unacceptable." "White background and black text is my least preferred method of viewing. White distorts the letters." "If I try to read light on dark texts after a few lines all I can see is stripes." "It becomes a strain to read documents that are not made easy to read through magnification or color scheme changes such as white lettering on black background." "Pale text on a bright background is less problematic than dark text on a bright background. But a bright background is always a problem." "Text with low contrast or too much contrast is wrong for my eyes." The study of user style sheet settings found that people set conflicting colors. Of those analyzed, 6 set dark text on light background; 5 set light text on dark background; (some didn't set colors). Most color settings were high contrast (21.00:1) black and white. One global style sheet set low contrast of 4.75:1. Not only are there differences between users, individual user’s needs are sometimes different depending on their situation. Participants in the RTF-PDF Study and respondents to the User Research Survey reported that their needs varied depending on the amount of text to be read, the time of day, fatigue, and the complexity of the information. All these potential conflicts clearly point to the requirement for users to be able to customize text according to their specific needs at a given time. "I absolutely hate using the leading adaptive screen enlargement programs like Zoomtext and Magic because they tend to enlarge every image equally and waste a lot of space on the screen." Screen magnification software often requires people to scroll horizontally to read lines of text; however, some people cannot effectively read text that requires horizontal scrolling. Survey respondents commented that horizontal scrolling with screen magnification software made them nauseous, disoriented, and frustrated. Screen magnification does not allow users to customize many aspects of text display. Screen magnification software is not a viable solution for some people because of insufficient functionality, complexity, availability, cost, or other factors. Copy and paste also has limitations. Often the semantic markup is lost in copy and paste, for example, headings and lists are not preserved so the paste looses formatting to distinguish elements. Please be careful in referencing the information on this tader.info website as from the individual Shawn, not related to her employer. Some of the information on this page is published in peer-reviewed papers, which might be better for referencing in scientific papers and such. See Research for links to the papers. Henry, Shawn Lawton. (2016) Understanding Users' Needs to Customize Text Display. Available: http://www.tader.info/understanding.html. Last accessed 4 January 2016. 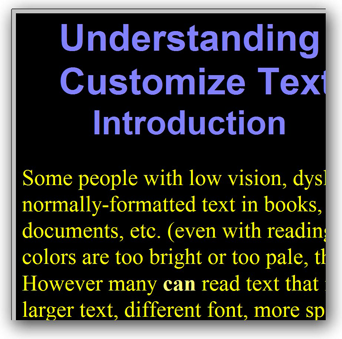 Text Customization for Readability for an introduction to the big picture issue. User Experiences for personal stories that provide insight into how real people with low vision, dyslexia, and related conditions that impact reading interact with electronic text. Example text displays of how people have customized their text. Tracy, Walter. (1986) Letters of Credit: A View of Type Design. London: Gordon Fraser. Tinker, Miles A. (1963). Legibility of Print. Iowa: Iowa State University Press. Note: In his seminal research, Tinker used only the term legibility to avoid confusion with readability formulas for the level of difficulty of the language; however, most recent literature distinguishes between legibility and readability as explain on this page. Arditi, A. 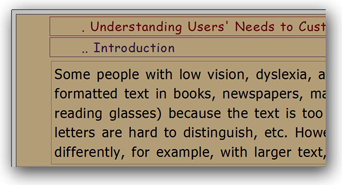 (1999, 2002) Making Text Legible: Designing for People with Partial Sight. New York: Lighthouse International. Calabrèse A, Bernard JB, Hoffart L, Faure G, Barouch F, Conrath J, Castet E. (2010) Small effect of interline spacing on maximal reading speed in low-vision patients with central field loss irrespective of scotoma size. Invest Ophthalmol Vis Sci. 2010 Feb;51(2):1247-54. Hartley, J. (1999) What does it say? Text design, medical information, and older readers. In D.C. Park, R.W. Morrell, and K. Shifren, eds. Processing of Medical Information in Aging Patients, 233-48. Mahwah, NJ: Lawrence Erlbaum Associates. Holt, B. (2000) Creating Senior-Friendly Web Sites. Center For Medicare Education Issue Brief 1(4):1-8. Morrell, R. W., Dailey, S. R., Feldman, C., Mayhorn, C. G., & Echt, K. V. (2002) Older adults and information technology: A compendium of scientific research and Web site accessibility guidelines. Bethesda, MD: National Institute on Aging. Gregor, P. and Newell, A. (2000) An empirical investigation of ways in which some of the prob-lems encountered by some dyslexics may be alleviated using computer techniques. In Proceedings of the fourth international ACM conference on Assistive technologies (Assets '00). New York, NY, USA: ACM, 85-91. Date: Updated 2 January 2016. First posted 2013.